Search engine optimization is something you’ve probably heard floating around in Facebook groups or seen in your Pinterest feed. The BEST type of traffic is search traffic. It’s also called organic traffic. People pop in their question or search a term, and BOOM – they go to a blog post for the answer. It would be nice if they went to your blog, right? Most users don’t look past the first results page on Google. And to be more truthful – they don’t go past the top three results on page 1 (after the ads). Ranking for the number one spot is nearly impossible for brand new bloggers. Did you know there’s another SEO platform? And it’s dominating search results. In fact, more and more are using Pinterest instead of Google to find the best chocolate chip recipe or to figure out how to make money as a new blogger and about a billion other search terms. And if you can optimize your search strategy to rank in Pinterest, you can effectively start ranking on Google. When this happens, your blog traffic grows, your list grows and your income grows. Twins Mommy isn’t yet three years old. It’s considered a new blog still. And, you know what? I’ve been able to rank #1 in both Google and Pinterest – twice!! The best part though – you can do the same thing. But, first, let me tell you my story of ranking on both Google and Pinterest and then help you do the same thing. Note: any Google searches were done incognito, making the search not related to my browser behavior or history. I published my first Twins Mommy post on March 13, 2016. I did not have a content strategy in place, so I wrote as much as I could in the beginning. The post that eventually ranked on Google was published on April 21, 2016. In all honesty, I don’t know when Google started ranking this post as #1. I suspect it was closer to a year after I published the post since I didn’t create that post with keywords in mind or any SEO strategy. 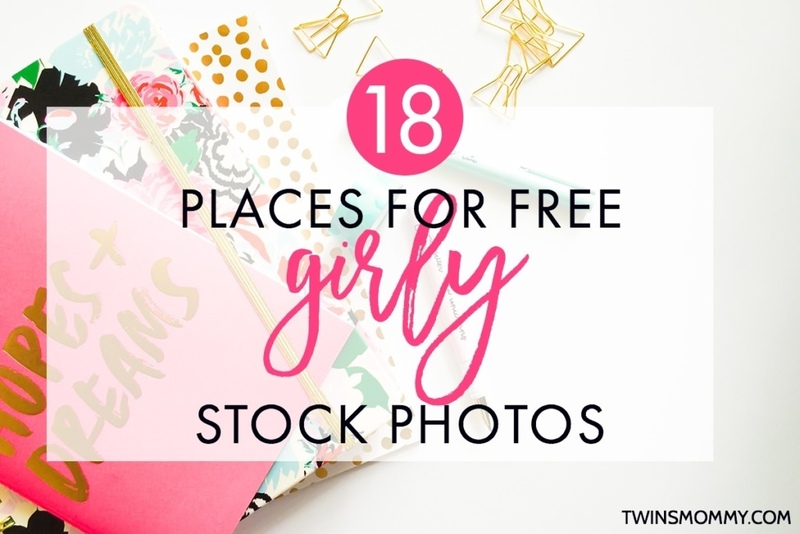 I wrote that post because I was frustrated trying to find free gorgeous and feminine stock photos. At that time, there weren’t tons of pins promoting free stock photos so I had to do a little bit of digging to find them. Right now, two of my posts rank on page one as the first two spots in Google. The second post in the search results was published April 11, 2017. I suspect it became #2 in Google for that search term just recently. So, as you can see, Google trusts Twins Mommy as having great content. This factor is a foundation strategy that I talk about in Ready Set Blog for Traffic. Because of this trust factor, any new post is considered more valuable than other posts on other people’s new blogs, which helps in ranking in Google. In Pinterest, I’m also the #1 spot for this keyword. Now, which came first? Google or Pinterest? I think ranking in Pinterest came first in my opinion, but I don’t know for sure. Since Pinterest is a huge search engine, it only makes sense that what ranks in Pinterest can eventually rank in Google (if the topic isn’t competitive like blog traffic or list building tips). My second post was published July 26, 2016. This post took a life of its own on Pinterest. When I first started Twins Mommy, I decided to use a new traffic generation strategy which focussed on Pinterest. You see, I never used Pinterest as a marketing way to promote my other blog. This post was written four months after starting Twins Mommy and after starting my Pinterest strategy. So, way back then, I didn’t do anything that I do now to promote my posts on Pinterest like create multiple pins, create infographics, re-save my pins to relevant boards and more. I pinned this post ONCE to my Twins Mommy board and then scheduled it to Tailwind maybe once or twice after that. 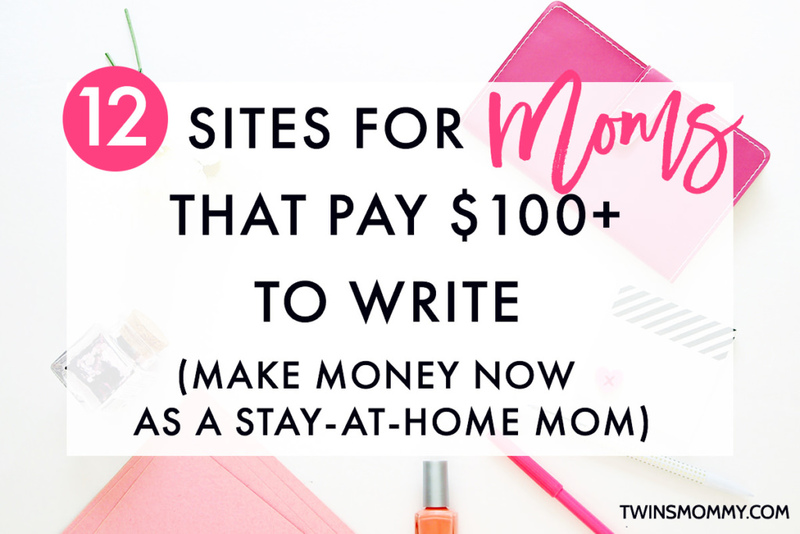 I forgot about that post since during that time I was pivoting to more traffic building tips and email tips. So for a year, I didn’t pay attention to this post. 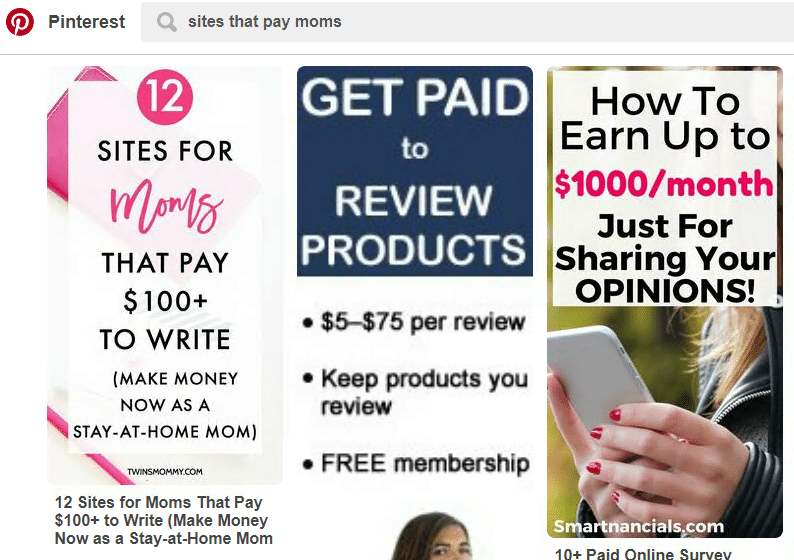 It was only after deciding to do this post that I realized that I rank #1 in Pinterest for sites that pay moms and in Google too! 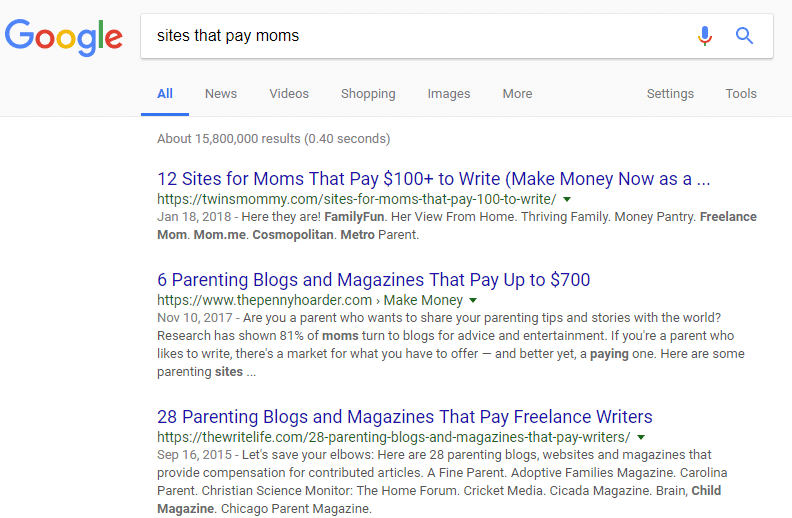 And what is surprising is that in Google, the two results after me are really really (really) high authority sites – the Penny Hoarder and The Write Life. And what’s more surprising is that this post is still circulating on Pinterest after a year and half later! I recently created a new pin for this post and it started trending on Google. This boosted the life of this post and it went mini-viral. For a while every day multiple people are viewing this post, a year later and saving it like it’s a brand new pin (i.e. older pins don’t get a lot of saves, only newer pins…usually). Mamas! I have another post on Google ranking #1 but it’s not yet ranking on Pinterest. And I’m not sure it ever will? So this post was published on October 4, 2016. And it got picked up by Tailwind. Tailwind started promoting it on Pinterest. Like a lot! But, if you search for “Pinterest followers” on Pinterest, my pin doesn’t show up in the first row. Just recently, my post is ranking #1 for that keyword in Google (after the feature snippet). I’m not sure how I scored beating Social Media Examiner, Post Planner and QuickSprout on this, but I did! Google is ever changing so I may not hold that spot, but for now, I’m happy. My organic reach is growing because of these ranked posts. But, what I find funny is that because of all the saves and shares on Pinterest for this post, it helped rank this post on Google, but not yet on Pinterest. So what are the steps to ranking for both Google and Pinterest? *UPDATE* I spoke to a few entrepreneurs (clients of mine) and tooted on some SEO blogs and it looks like Google DOES look at social signals to help with ranking. Since my Pinterest followers posts has a lot of shares, it could have helped with my ranking. If you noticed, I used Pinterest to help me get these posts moving. This means having a strong Pinterest SEO strategy on this platform. From your pin description to your bio to your board names and descriptions, you should be using keywords. You can use Pinterest to discover keywords that are relevant to your pin topic. I suggest using an excel sheet or G sheet to keep a list of these keywords as I think you’ll probably use them again and again like I do. One other thing you need to understand is that Pinterest is sort of like the party platform. You need to be the popular one on Pinterest to get noticed. This can take a while to develop – for me about a year. These are the two factors letting Pinterest know you are popular. When your pins are getting a ton of engagement – saves, click-throughs, close-ups – and sees your profile is authoritative by the number of followers you have, Pinterest takes notice. And good things start to happen. Pinterest loves me right now! I gush and I blush saying that. Recently many of my pins have been trending (while I’m testing new pin graphics). Wonderful bloggers are telling me that my pins are trending too! How do you get your pins trending? 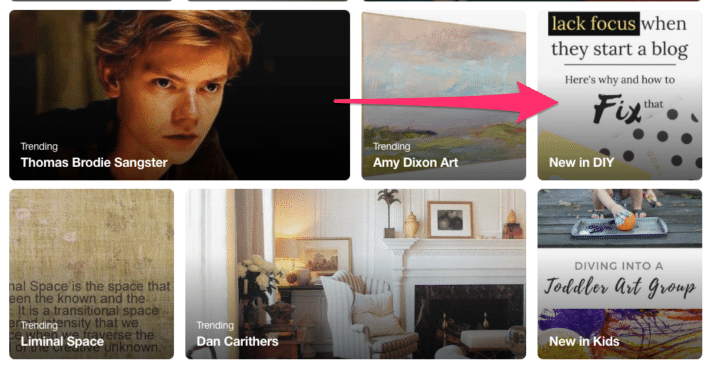 I haven’t really figured that out but I suspect if you give Pinterest content consistently, they may place your pins on the trending page or in one of its categories. Many bloggers are saying to make sure to pin your pins to relevant boards. If you have a pin on the best breastfeeding tips for new moms, you should save boards with the word breastfeeding in it. Search on Pinterest for what people want to know about breastfeeding and create several new boards. Do this for all of your new pins – if you don’t have a relevant board to pin it to, make one. Make sure to also get that pin out there! So, pin to those BIG group boards – catch-all boards or niche down ones. In the beginning, the strategy is to get your pin seen and you do that by pinning to big group boards. If you notice, I did not use a keyword strategy to rank in Google. I created posts around frustration points and those posts got shared, linked to and eventually ranked in Google. So how do you get Google to notice your content? Posts that are ranked solve a problem. Whether you are looking for a recipe for Valentine’s Day cupcakes or need to know how to swaddle a baby, people use Google to solve an issue they are having. When coming up with blog post topics, make sure you solve the WIIM factor – What’s In It For Me. Your reader is asking that question as they read your post, so make sure you answer that. Remember, Google is trying to find the BEST answer to your search query. You can start ranking on something that other’s haven’t figured out yet. 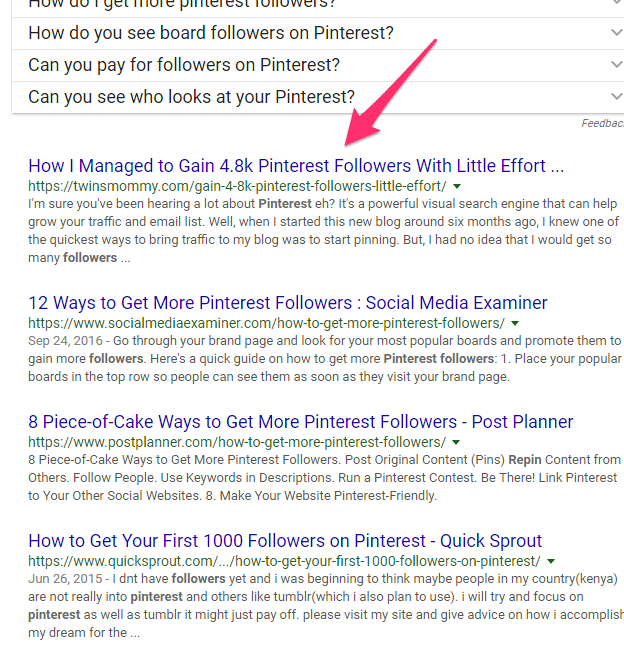 For example, the search term Pinterest followers in Google shows a lot of digital blogs ranking on the first two pages. I’m the only “mom blogger” on page one. On page two there are two other bloggers. So, you can see the topic of Pinterest followers was mostly written by digital marketers and not bloggers. My post was created at the right time for Google. When trying to find that gap, search on Google to see what is already ranking. Maybe you notice that bloggers aren’t talking about this one thing so you have a shot now. Or, bloggers are talking about this, but you have a totally different strategy. Figure that out and write the content. This is called backlinks and something I teach and show you how to get backlinks in Ready Set Blog for Traffic. 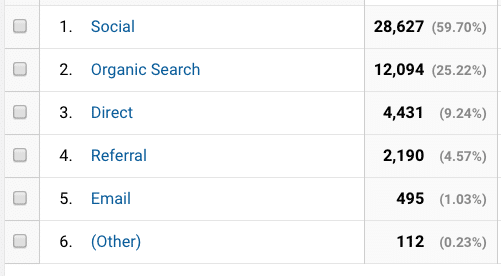 To find who is linking to you go to your Google Analytics > Acquisition > Referrals. You have to click over on the next few pages to see blogs that link to you since the first few results are social. For example, I see Tailwind linked to me! Backlinks are one of the factors in ranking in Google. In fact, Google favors 2 ranking factors: backlinks and quality content. To get your blog out there, start stalking, ahem, I mean following influencers in your niche. If you have the guts, reach out to them. You can do this simply by blog commenting. Or, you can message them on social media or email them. For example, I reached out to Neil Patel and we spoke a bit on LinkedIn. Now, I know I probably didn’t really speak to Neil – he’s super duper busy and a HUGE influencer online – but I got on his team’s radar. And months later, I learn he linked to my Elna Cain blog in one of his posts! I about died when I found this out. So go ahead and reach for the stars. Tag an influencer or message them on Facebook. Reach out to them because you never know what can result from that!!! 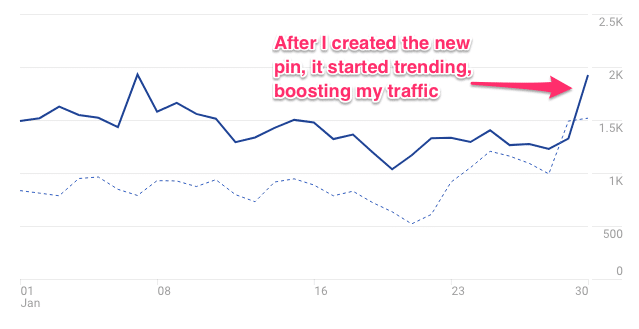 That’s why I feel my post on how to grow your Pinterest followers ranked in Google – by the social shares it has received. And the best way to get more shares is to schedule your posts with a social automation tool – like Tailwind. Tailwind has done wonders for my blog’s growth. I talk all about it in this post. 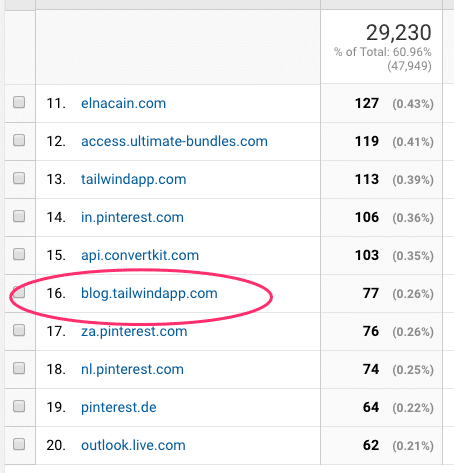 Whether you use Tailwind or some other tool, consider investing in one as a strategy to grow your blog. Figuring out SEO doesn’t have to be hard. You don’t need keyword tools and you don’t need to learn everything about SEO. If you have a mobile-ready blog, if you optimize your images and write valuable content, you will eventually start ranking. This method does take time but remember – slow and steady wins the race! Over to you – tell me your successes with ranking in Google and/or Pinterest! I want to hear them. That is a lot of great information! SEO is one area that I struggle with because I feel like either I’m not doing enough of it or my keywords are the right words. This post has definitly given me a great new direction though, thanks for sharing! Thank you so much! Yes, understanding SEO is tough! It really took me many years to understand it and practice it and fine tune it. So I hope my posts speed up that process for newbies like you! Thank you for such a helpful post! I’ve been running an online shop for almost a year now and just added a blog to it recently. I’ve really been stepping my game up on researching and implementing marketing ideas, and SEO has had me SO CONFUSED! It’s always dragged out and explained in such a long, ridiculous way that by the end I’m like “wait…what? !” Lol. But you made it SO EASY to understand and gave such simple tips for using SEO. I’m super excited to start trying it out with my posts and my shop, thank you again so much! I’m so glad you found these SEO tips for bloggers helpful and easy to implement! Yes, there are easy things you can do quickly to help with your ranking potential! Have fun! I just literally today started working on improving my Pinterest SEO. I tried a little bit previously but I don’t think I really what I should be adding to my pins. But I came across some tips recently to help me rank on Google. I created a post that I optimized to rank on Google and published it this week. I also created some pins that I published today and yesterday incorporating SEO, or at least I hope I did, LOL! I’ll have to update you and let you know if that post or my pins actually do eventually rank at all. How exciting! I can’t wait to hear the results. Keep creating new pins and new content! Thank you so much for this post! This is the hardest part of blogging for me but you made it more clear. Now I’ve got to get to work! You’re welcome! So glad you found some tips to help you grow your blog traffic! Your posts are so, so, so super helpful! I’m learning more and more about Pinterest, every single day. I’ve realized that it’s good to look for trending topics on Pinterest. I search for pins that do really well and I’ve recently realized that writing blog posts based on topics that have lots of repins on Pinterest is a really good strategy. Thank you so much for sharing this post. I have a post that’s ranking on Google’s third search on the first page but it landed up there totally by accident and with no SEO. 😛 I was just lucky I guess but I realized that I could harness that gift by adding lots of related posts and linking to those in that particular post. 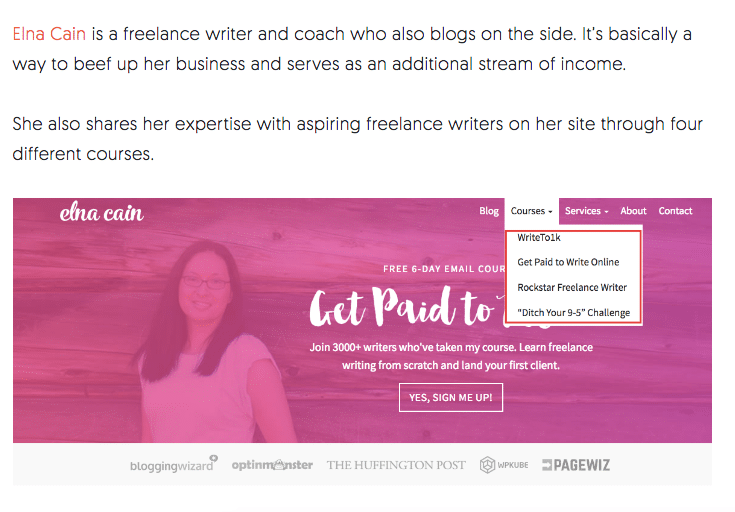 That tip actually helped boost my blog traffic like crazy. Thank you for being such an inspiration. Looking forward to every email you send. Thanks so much! Glad you found this post about ranking on Google helpful 🙂 Congrats on getting on the first search page on Google! I have been reading as much as I can on Pinterest, keywords and getting traffic. I was averaging about 50 visitors a day from Pinterest and 100 one day. My people reach on Pinterest is growing but this week I noticed that my website visitors dropped by 70% (According to Pinterest analytics). I just don’t get it. I taught since my people reach was growing then my visitors would grow also but instead my traffic has dropped to almost nothing. I wouldn’t worry about your website metric in Pinterest Analytics. It’s not very accurate at all. Look at your Google Analytics instead! 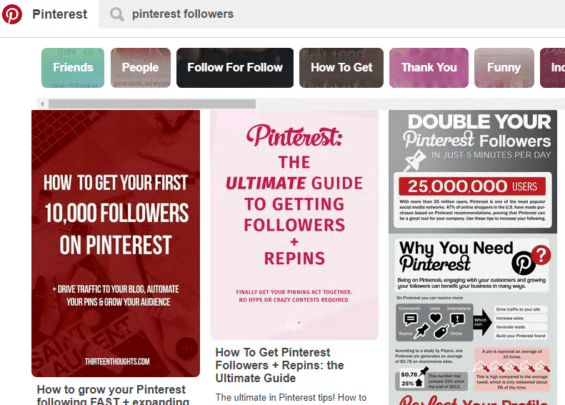 I love reading your posts about using Pinterest for SEO ranking. I truly believe it works. Thanks for all the tips. Thanks so much! Glad you found some good SEO Pinterest tips! I repinned your blog post using these hashtags #pinterestmarketing #pinterestseo #pinterestmarketingtips. Curious to see the advantage of hashtags in 2018. Growing Pinterest followers is a challenge now than it was years ago. I found the best way is by using Tailwind! Great information around SEO Elna. Like you said search traffic can be tricky because of the constant changes and updates. Thank you so much! Yes, traffic is tricky and you need to diversify your traffic streams to ensure longevity in this blogging world! That’s amazing! I LOVE hearing a story like this. Congrats on getting on some great group boards! That’s where it all starts for traffic building! Good luck and have fun strategically pinning! I really like your blog! Thanks for the content! Thank you so much. So glad you liked the post and I hope it helps with your Pinterest traffic and SEO ranking!! I loved your post! It has really motivated me and has sort of given me a guide to which direction I should head next as a blogger. Keep writing great content! Thank you so much! It means so much to me hearing from followers like you! I’m so glad this post will help you with your blogging journey!!! Thanks for sharing!!! Your content has helped me so much! I always look forward to seeing what new post you have. 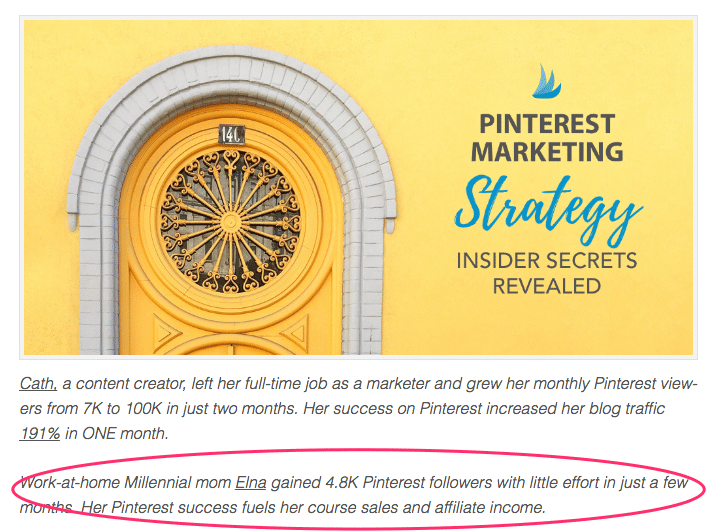 I followed the tips from your course, Ready Set Blog for Traffic, and already increased my Pinterest followers by 10!!! Keep up the great work!! Yay!!!!! So happy to hear this. So glad Ready Set Blog for Traffic helped you! Elna! You always have the BEST posts! When I read your posts I ALWAYS learn something new! As always thanks for sharing!! No surprise your trending!! You rock Elna! Keep kicking @ss!! Another great post 🙂 I just got your Google cheat sheet. A while back did you offer a download for headline ideas….or am I just imagining that?…lol. If so, can you point me to it so I can get it? Thanks! Thanks so much! Yes in the “other” FB group 🙂 ha… SEO is important but my honest opinion is that new bloggers shouldn’t worry about finding the right keywords. It takes time to rank in Google as you can see from this post (up to a year). Write valuable posts and you can eventually rank. Needed this! I have only been blogging for a month now and it can be frustrating not having many stats to know what’s working. But from your post, I know I need to be patient and consistent. I just want everything right now 😉 thanks for breaking it all down – it’s really helpful! Thanks for stopping by and yes, you need to be patient. Getting ranked in Google for a new blogger can take 6 months to a year. So, for now, write valuable blog posts and get to know your audience! You’re welcome! I’m so happy you are going to try Pinterest! Yay! Make sure to check out my 12 days of Pinterest tips!! When it comes to quality content creation and value, your name is always there. I’ve seen these posts on Google and I was like, her content is meant to be on Google! You’ve made some excellent point here. I’m definitely looking forward to following some tips on content to rank. Love your blog btw! Thanks for stopping by. 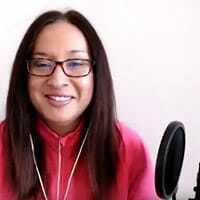 I hope these Google ranking tips are helpful! I really enjoyed reading your posts and I find it rewarding that finally Google ranks posts that contain value! 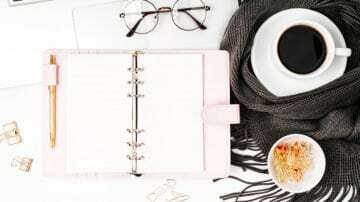 Your posts are one of a kind and what I can learn from you is that quality is better than quantity, and that’s what every one of us should strive to achieve through her blog!! Great content on your blog and, just as important–great presentation & design! You are correct that SEO is a scary term for a lot of bloggers, and to be honest the SEO industry makes it seem a lot more complicated than it really has to be. 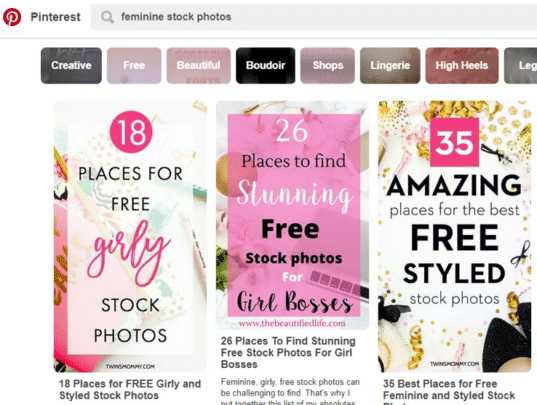 Re: your “feminine stock photos” post that ranks #1, did you know that it *also* ranks #1 for two additional keywords that actually get *more* search volume than the “feminine stock photos” keyword? 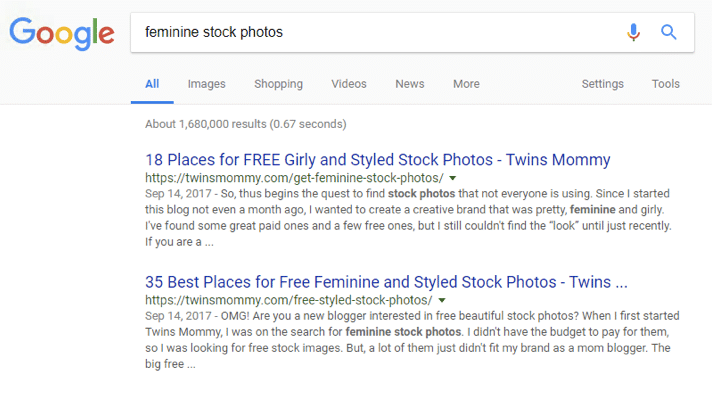 What that’s showing is that they keyword “styled stock photography” — which you also rank #1 for — is actually bringing you *more* search traffic than “feminine stock photos”. Pretty cool. And as you mentioned, links are THE most important ranking factor in Google. One small thing I want to nitpick in your post is the correlation between ranking in Pinterest and ranking in Google. As far as I know, Google does not take ANY consideration into social media performance when it comes to their algorithm. In other words, just because you perform well on Pinterest, doesn’t mean you’re going to rank in Google. But you’re right, it’s smart to optimize for both. Alright, I could chat for hours talking about this stuff. Just wanted to add my $0.02. P.S. By the way, getting a link from Neil Patel is a BIG freaking deal! Thanks for stopping by! Pretty cool rankings is right…maybe I should take up photography as a hobby! I do find that social signals help, even if indirectly. I’ll often search Pinterest looking for great examples when I’m writing for clients. If I reference someone, they’re getting an unsolicited link from an authority site. I’ve also seen increased social “chatter” improve rankings. All in all you’re right, it pays to be well-rounded. I love this post, and had no idea I could look at back linking in my Google analytics! So that was interesting to see (and something I’m going to start working on asap)! I think I also plan to create new pin graphics with actual questions on them. My posts answer questions but I’d like to explore this idea some more! No, thank you for letting me know about my trendy pins! I never know! Thanks for stopping by! Yes, I haven’t looked at my backlinks in like a year! ha..but it is fun to see. Yes, try that Pin graphic strategy! I did that for a bit and may do it again. I’m just a sucker for writing copywriter headlines on my pins! My journey with Pinterest has just begun. You, like other successful bloggers I follow strongly advise about the importance of Pinterest SEO. This post excellently lays out the process to follow if you want to rank with Google. 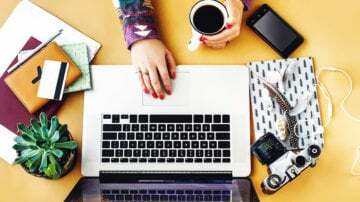 As a new blogger, I ‘m sponging it all up. 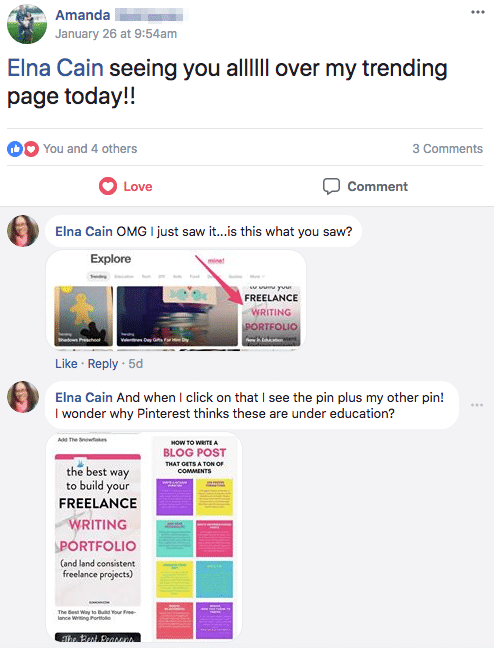 Thank you Elna for never failing to extend my blogging education with every single post. Yes, soak it up mama!! I’m still trying to figure out how to get more organic traffic and it’s a little more difficult than I thought it would be. Pinterest is definitely my #1 traffic source right now, but I’m still working on perfecting my keywords. I know what you mean. That’s why I don’t focus my SEO strategy on Google. It’s just a byproduct of focusing on Pinterest and creating valuable posts. Good luck and I know you’ll succeed!